Below is a slide show of our 2008 motorcycle adventure from London, England to Cape Town, South Africa. Tom, Jerry, and myself (and Ted from London to Istanbul) travelled through 25 countries over the course of 3 months. We travelled 24,000 kilometres by motorcycle. So far we have raised about $4,000 for HIV treatment and prevention in Africa. The slide show is roughly in chronological order starting with our departure from London, continuing across Europe and the Middle East, and then Africa from Egypt to South Africa. The video ends with our arrival in stunning Cape Town. 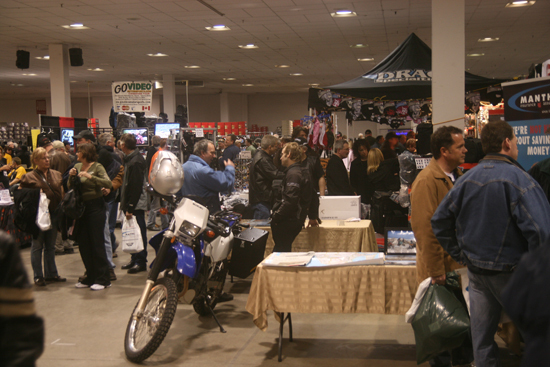 Jeremy and I spent last weekend at the Toronto Spring Motorcycle Show manning our booth. My DRZ was on display with its brand new black powder-coated aluminum Happy Trails Panniers. We also had photos and a map of our London to Cape Town route spread out on the table. I was surprised at the sheer number of people who came up to us to chat and ask questions. It was impressive to see how much excitement our adventure seemed to generate. I didn’t realize so many people had dreamed of going on their own round-the world adventures. 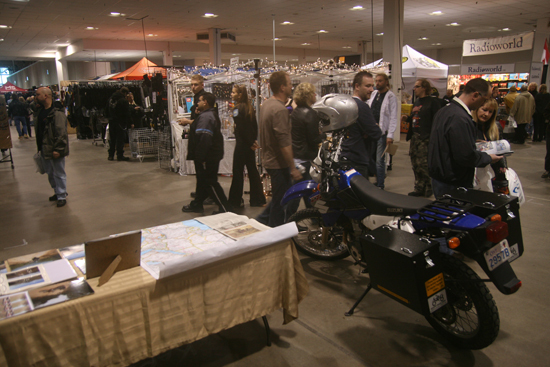 We even talked to a number of people who had ridden their motorcycles through some of the far off reaches of the world. One elderly gentleman had done a trip like ours over thirty years ago. I enjoyed listening to his stories – they made me feel grateful for my opportunities for adventure because one day I too will be an old man with stories. Despite the fact that it was already April, we also sold a good number of our charity calendars, raising another $230 for Dignitas. We didn’t set a price, but rather said we were giving them away in the hopes that people would make a donation. And people did so – generously. Above: the view from our booth, which was in a prime location at a major intersection. It was exciting to see my bike one step closer to being adventure-ready. I am looking forward to being on the road again, even if it is on my own continent.